So listen, I’ve been reading about bra sizing and cup volume and different construction methods etc., etc. online for the last five years, and bra sizes can still confuse me. When I was in Virginia a while back with Mom and we went bra shopping at Nordstrom, I found myself totally flummoxed trying to pick sizes for her across different brands and countries of origin, because an E cup in one brand meant a G cup in another brand and on and on. So if you’re feeling overwhelmed, let me just say I’m right there with you. I did find this Totally Awesome Thing, though, and if you’re a visual person, this could be a great way to understand sizes a little better. 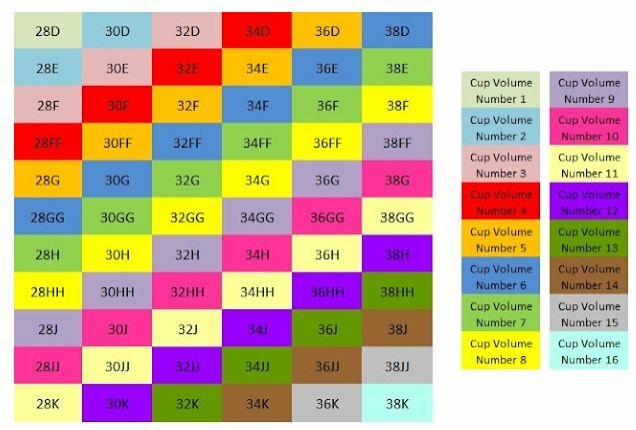 This excellent chart was created by the author of the Butterfly Collection blog (NOT BY ME) to illustrate how different cup sizes that have the same volume relate to each other. She’s also posted a picture of five different sizes of the same bra (30D, 32D, 34D, 36D, and 38D) to illustrate how different “D-cups” can be. I’ve mentioned sister sizes before, but this chart shows you better than I could describe how bra sizes describe both ribcage circumference and breast volume. A woman who wears a 30JJ bra has the same breast volume as a woman who wears a 36H bra, but their proportions are different. When we have many band sizes and many cup sizes, it helps us to fit women on a much more individual and accurate level. Also, this chart only compares 66 sizes, and it doesn’t reflect women who may be fuller-figured or smaller-busted. It makes me a little more forgiving of manufacturers who have to take all these different possibilities into consideration (but only a little: the most recent Victoria’s Secret catalogue shoved into my mailbox boasted of a bra “now available in 38B and 36C!” Um, good for you, Vicky’s, for stocking two slightly random but completely average sizes? I fail to see the achievement). The article and the accompanying comments and responses from the author and her readers are really pretty wonderful. I’m still a little fuzzy on the D/DD/E-cup set of sizes, to be perfectly honest. I left them behind long ago and haven’t had to worry about them, but she’s absolutely right to point out that these cup sizes can be among the trickiest to fit, since it’s where many brands and cup sizing systems diverge from one another. For example, it’s around where Wacoal, an “American” (actually out of Japan) company goes like this: D, DD, DDD, G, H (huh? ), but a British brand would continue with double letters (D, DD, E, F, FF, G). And then on top of that apparently a US DD is not the same volume as a UK DD? Eesh. So if you think you may wear a cup size in this range, I feel for you, truly. If you’ve figured out how to translate your size across different brands, I would LOVE to hear from you. What size do you wear in Wacoal vs. Chantelle vs. Freya or Panache? Thanks for stopping by! 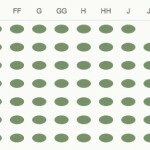 I thought your chart was just totally brilliant, and I’ve so enjoyed reading your blog and hearing about all the great work you all do. Keep it up! Thank you so much! 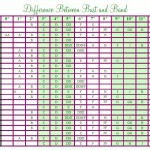 I’m a 36H and it’s been so hard to figure out my sister size. This chart it awesome.